If you think that the highly paid employees of Google, Facebook, Apple choose cats or dogs in order to emphasize their high social status, you are mistaken. The American establishment suddenly fascinated by the chickens. It is reported that the content of chickens in suburban homes, more similar to castles, became very popular. And, of course, resulted in the earning potential of those who are in any way associated with the poultry industry. While for obvious reasons, the money doesn't matter. For example, for the Chinese silk chicken easily give $ 300, according to "Süddeutsche Zeitung". 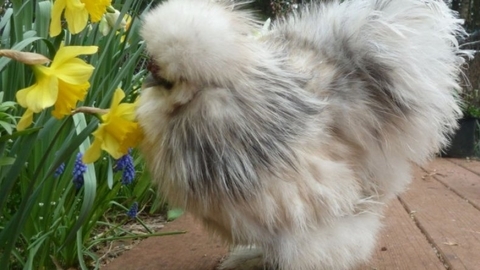 The Chinese silk chicken called "smile of nature" is the "fluffy" chicken in the world. Chicken coops for chickens glamorous is a stylish houses, similar in design to the house of the owner, or, alternatively, a romantic log cabin. They are equipped with automatic lighting and feeding, including surveillance cameras. Profitable industry of services has firmly formed around the chicken-glamorous hype. In the supply chain – breeders, veterinarians, consultants on contents. Of course, each of the elite of the birds has a name and, as they say owners, with their own personality. Accordingly, diseased animals in any case do not send in soup, and for big money. And the icing on the cake for chickens specially hired professionals sew by hand... chicken diapers, so the animals could visit the owner with a return visit.